Small enclosures and unnatural accessories impede natural behaviors which leads to stress and, in turn, behavioral issues such as self harm, unnaturally increased or decreased appetite and repetitive movements. Enclosures need to be assessed from the animals view point, not human convenience. Bearded dragon behavior provides clues to the reptile’s health and well-being. 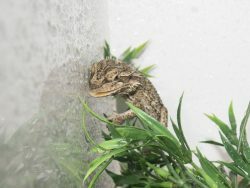 Providing environments that allow bearded dragons to express natural behaviors and interpreting those behaviors is an important part of care. Keeping reptiles in captivity requires consideration of not only anything that can impact their immediate health (such as burns, impaction, attacks from other animals and poisons) but also health issues that build up slowly over time (such as kidney disease, gout and periodontal disease). The best means to prevent and control any illness or disease is through providing the correct care. Other health considerations are those which impact reptile keepers and potentially even their family, such as Salmonella. When your bearded dragon is warm it will react differently as to when it is cool. This can impact where you think you are with the progress of the taming process as it becomes far more animated and reactive when warm. Temperature may not be the reason, but it is worth checking they are not fluctuating too much except for the expected changes between night and day. Controlled fluctuations can come later as part of environmental enrichment once the relationship has been established. Yes bearded dragons can bite. A bite can break the skin and cause bruising. But your bearded dragon will usually let you know it isn’t happy before it bites you by hissing, puffing, displaying its beard or even trying to run away before resorting to biting. If you see signs that your beardie isn’t comfortable and is giving the impression it may bite, leave it to calm down first. Consider how to refocus its attention before touching it. There are some tips for helping your bearded dragon to become more friendly in the article on taming. If you do ever get bitten by your Bearded Dragon, go to your doctor even if the wound is minor. Any broken skin no matter how small from an animal bite should receive medical attention immediately. Do I need to remove the eggs from the female? Bearded Dragons do not have maternal or paternal instincts, they lay their eggs and leave them, their role as a parent ends there. Any eggs laid that are to be hatched are removed after laying and hatched separately. Hatchlings will be killed if left with either parent. Reptiles are prone to burn injuries with one of the culprits being heated rocks. While there are some who sell these products claiming that this is no longer an issue with the latest heated rocks and that they are safe there are still vets who are having to treat the resulting burns reptiles. The heat rock does not need to malfunction to cause burns, it can simply have hot spots and mixed with the sensory deficiency of the bearded dragons belly. Douglas R Mader (MS, DVM, DABVP) delves into sensory deficiency in reptiles and possible causes in an article Understanding thermal burns in reptile patients (Proceedings). This article goes further into the ways that reptiles receive heat naturally, burn injuries, types of burns and treatments. As more and more online services become available, vets have competition for parasite testing. While this does appear to be quite attractive, it is not necessarily effective and could lead to incorrect results. Tests are best performed on stools less than 24 hours old to minimize development or destruction of parasites which will inhibit testing. Samples kept between 4 to 8°c will reduce the development or destruction of some parasites, however others, i.e., flagellates are best kept alive at room temperature. A teaspoon sized sample is sufficient from two or more stools as evidence of parasites can be intermittently shed and may not be apparent in a single stool. Seal the sample in a zip lock bag or sample. If obtaining a sample is not possible prior to visiting the vets, the vets will be able to extract a sample. 1 Fry, Bryan. (2105) Venomous Reptiles and Their Toxins: Evolution, Pathophysiology, and Biodiscovery. Wild male bearded dragons control territories, this does not change in captivity. The males will protect their territory from other males. Contact will result in fighting. Females hold smaller territories within the males territory. The same body condition scoring used for mammals, is also applied to reptiles. Scale ranges from 1 (emaciated) to 5 (obese) or 9 (grossly obese), depending on the scoring table used. Reptile considerations for body score include girth of the tail and palpability of the ribs. Body scoring by scales is subjective but useful as a quick guide and for longer term monitoring of body condition. Emaciated Fat is not visible. Bones visible. Thin Limited fat. Ribs and pelvic bones visible. Optimal Bone outline may be slightly visible. Mildly overweight Bones may be slightly visible. Few millimeters of fat over ribs and tail. Obese No bones protrude, nor palpable. Base of tail very thick. Fat is interfering with normal movement including length of stride. Bearded dragons can learn by watching and imitating others, even when watched by video. For the full story go to LiveScience.com.